Herbert Howells composed more than twenty settings of the canticles appointed for use in Evening Prayer (the Magnificat and Nunc dimittis). Many of them are identified by the name of the cathedral in which they were first sung. 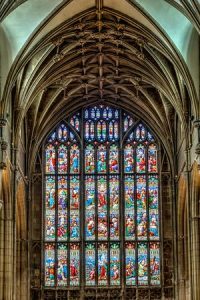 When commissioned to compose a work for initial use in a specific liturgical space, Howells took great care to understand the acoustic qualities of the place, especially how certain notes were naturally heard as having richer resonance. The boys’ voices creating that impression of Mary’s sense of wonder in those opening words ‘My soul doth magnify the Lord’. Howells’s musical line (which becomes two interweaving lines) snakes upwards like incense, seemingly moulding itself to the curviture of the vaulting. All this may seem fanciful but it is not. Howells was a supreme painter in music. He was the arch-impressionist. He felt his task to be the conjuring of an atmosphere which feeds the listener’s imagination and creates a sense of spiritual ecstasy which would engrave the textual imagery on the mind.